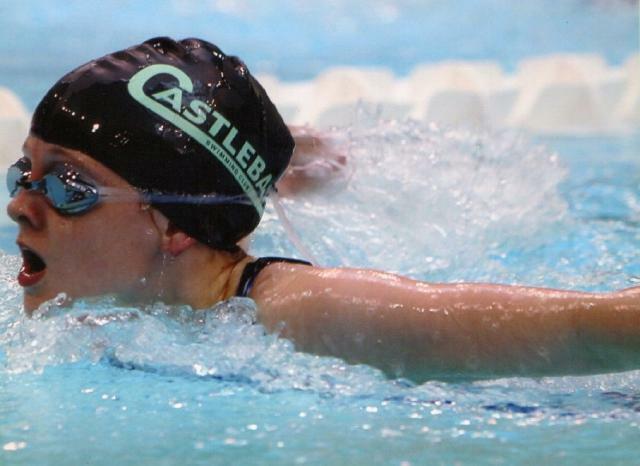 It started with a Thursday night drive through damp, grey drizzle and finished on a gloriously sunny Sunday evening as the junior squad members of Castlebar Swimming Club emerged blinking from the confines of the University Arena in Limerick. Three days of competition that at times felt like three lifetimes, but at the end of it all there were smiles - exhausted smiles, to be sure, but smiles all the same. The Castlebar Swimming Club coach pictured with the girls’ relay team (left to right): Joe Moran, Siofra McHale, Nicola Connolly, Niamh Breslin and Una Togher. Picture: Ann Connolly. The Castlebar Division 2 swimmers pictured with their coach (left to right): Una Togher, Aoibheann Hennigan, Niamh Breslin, Nicola Connolly, Siofra McHale, Niamh Heneghan, Nathan Rennick, Jamie Murphy and coach Joe Moran. Picture: Ann Connolly. Swinford’s Aoibheann Hennigan enjoys some quiet time poolside with her mum Pauline McCallion, also the team manager. Picture: Ann Connolly. Nicola Connolly relaxes after a race. Picture: Ann Connolly. Jamie Murphy (left) and Nathan Rennick during a break between races. Picture: Ann Connolly. 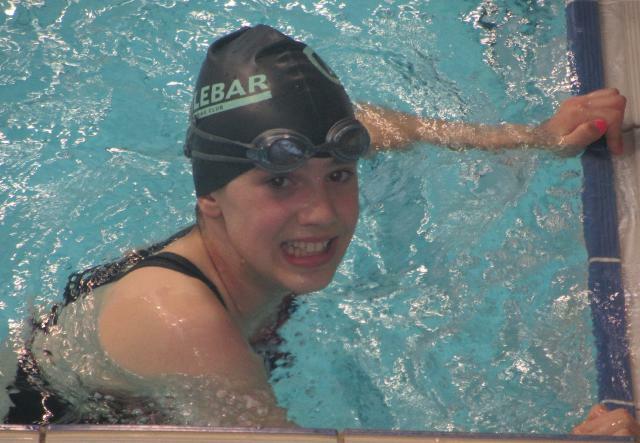 To get to Division 2 is an achievement in and of itself, and the young Castlebar swimmers were by turns excited and nervous, but also very determined to do their best. The first time at a competition of this calibre can be a daunting experience for a young swimmer, but club coach Joe Moran along with team managers Nicola Murphy and Pauline McCallion worked hard to ensure their young charges stayed calm and collected. Niamh Heneghan with her gold medal for backstroke. Picture: Ann Connolly. Siofra McHale in action during the butterfly. Picture: Ann Connolly. 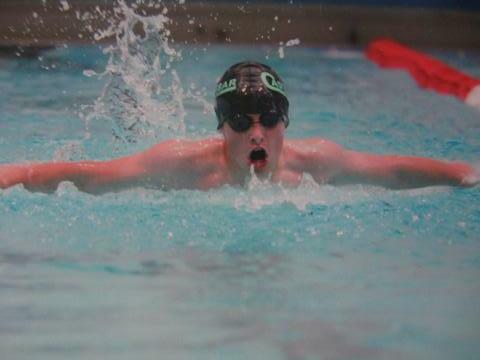 Breaffy’s Jamie Murphy in action during the butterfly. Picture: Ann Connolly. Day one of competition saw the boys take to the pool first for the 400 meter freestyle, and both Jamie Murphy and Nathan Rennick did well, achieving impressive times. For the girls, there were personal best times (PBs) galore in the 100m backstroke, with Niamh Breslin, Una Togher, Siofra McHale, Aoibheann Hennigan, Nicola Connolly all doing well, and Niamh Heneghan taking gold and a Division 1 time in her age group. 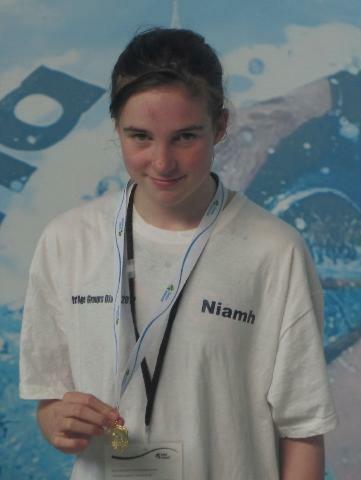 Niamh had a second strong swim in the 200 meter individual medley, earning a bronze in the final, while Jamie Murphy took silver in the same event. They both also earned their Division 1 qualifying times. The Castlebar girls relay team of Nicola Connolly, Siofra McHale, Una Togher and Niamh Breslin had tremendous fun in the 200 meter medley relay and really got into the team spirit of things, animatedly discussing their tactics and cheering each other on loudly. They narrowly missed out on medals, coming fourth, but even that wasn't enough to wipe the smiles from their faces. Nicola Connolly barely had time to draw breath before she was back in the water again for the challenging 800m freestyle, where she gained an impressive personal best of 11:02.81, taking bronze. Aoibheann Hennigan was just seconds behind. On Saturday, the challenging 400m individual medley saw Siofra McHale take a whopping 20 seconds off her previous best time, and earned her a silver medal, with her team mates loudly cheering her on every stroke of the way. In the girls' 100 meter butterfly, both Siofra McHale and Niamh Heneghan achieved PBs in their initial heats and qualified for finals, with Siofra taking bronze in her age group. Una Togher made it to a final in the 100m breaststroke with a personal best time of 1:31.24, taking five seconds off her previous time. The breaststroke also proved a highlight for Jamie Murphy who won gold and achieved a Division 1 time with a shiny, new PB of 1:26.03. There was another raft of PBs in the girls 200m freestyle, with Niamh Breslin, Una Togher, Nicola Connolly and Aoibheann Hennigan all swimming very well, and Nicola securing a Division 1 time. Sunday brought the final day of competition and more PBs for the girls in the opening event of 400 meter freestyle. Siofra McHale took 11 seconds off her previous time for a new PB of 5:43.71, Niamh Breslin went from 5:50.33 to 5:48.35, Niamh Heneghan knocked 14 seconds off for a new personal best of 5:31.90, Nicola Connolly's 16-second personal best of 5:22.42 earned her a Division 1 qualification, and Aoibheann Hennigan had a lovely swim that saw her take eight seconds off her previous time for a new PB of 5:23.38. A second gold medal came winging towards Jamie Murphy for a beautiful swim in the 200m breaststroke - which saw him take 14 seconds off his previous best time for an impressive 3:07.23 in his heat and an even better final time of 3:00.94. That, and his time of 1:07.94 in the 100m freestyle final earned him two more Division 1 times. Siofra McHale and Nicola Connolly gained PBs in their 100m freestyle, and the 200m backstroke was to prove very successful for Nathan Rennick, who gained a six-second PB of 3:01.75, for Niamh Breslin with a new personal best of 3:02.47, and for Siofra McHale who gained a 10-second PB of 2:56.10. In her age group, Niamh Heneghan swam a stunning 2:41.61 for a place in the final - where she took gold in 2:40.28 - and another Division 1 time. The end of a very successful and enjoyable three days in Limerick sees Castlebar sending an additional three swimmers on to join the 12 already travelling to the Division 1 competition which will be held - also in Limerick - from July 6 to 8. In fact, while the Castlebar Division 2 swimmers were preparing for the long journey home, the club's Division 1 swimmers who had qualified earlier in the year were packing their gear for a special training camp booked in Limerick for the very next day. So in the space of two weeks, Castlebar Swimming Club will have spent a total of seven days in the 50 metre pool in Limerick. Take the hundreds of swimmers and their various club representatives and family members, not to mention the number of Swim Ireland officials needed to run an event this big, and Division 2 adds up to quite the profitable weekend for hotels, bed & breakfasts, and local restaurants and shops. Looking around the car-park at all the different registration plates, seeing the vast mix of club colours and hearing a blend of accents from Lisburn to Longford, you can't help but wonder what a 50 meter pool could do for Castlebar, for Mayo ... for Connaught, even. As Limerick prepares to host the long-course Division 1 championships in two weeks time, making full use of this impressive 50 meter facility, it certainly gives pause for thought. And so we hit for home, books unread, walks unwalked, and all other plans largely abandoned, having existed in a three-day news vacuum during which the only headlines have to do with PBs, IMs, splits, well-executed turns and nail-bitingly tense finals. It was the best of times, it was the worst of times, and it was the most riveting of times.